Is Theresa May’s polling bounce as new Prime Minister already over? The Tories have fallen by 4 points and Labour has risen by three points in the latest YouGov poll, suggesting that Theresa May’s bounce in the polls as a new PM is already over. But the gap between Labour and the Tories was still at 7 points (Lab 31%, Cons 38%), albeit down from a 14 point gap earlier. All new Prime Ministers get a new bounce in the polls, as voters give them the benefit of the doubt early on. Even a new mid-term PM gets one, as Gordon Brown did in 2007 when he became the new Labour leader and PM. 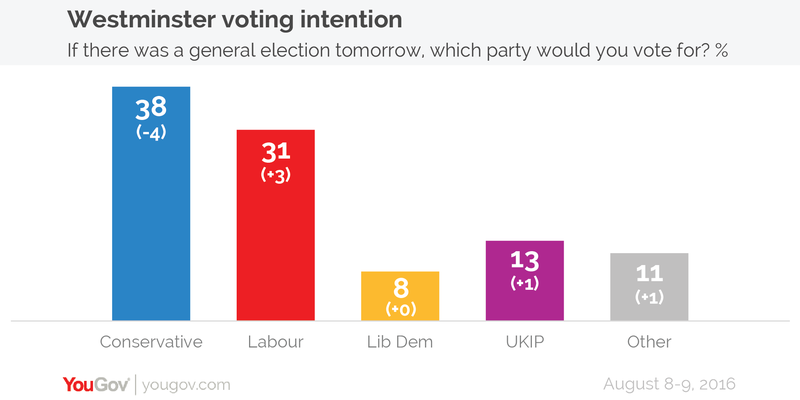 The latest survey of Westminster voting intention by YouGov shows: Conservatives: 38% (-4) Labour: 31% (+3) UKIP: 13% (+1) LibDems: 8% (-) Green: 4% (+1). The gulf between Labour and the Tories had stretched to over 10 points in the polling averages since May became PM. But if that gap is closing already, it suggests Theresa May has had a shorter honeymoon than most expected.